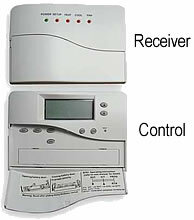 This thermostat can be used with heating and/or cooling appliances and adds both an on/off switch which allows it to cut the appliance off when not in use and auto fan switch which allows you to run the fan on heaters like the Modine and Sterling units continuously and act as a circulation fan. A useful feature in the summer and winter. Thermostat has a temperature range of 50° to 90° F, a separate thermometer display for determining room temperature, and require wiring. Temperature range is 41° to 95° F (2° F differential). - Multiple daily temp settings. - Fan auto or always on setting. - Memory backed up by battery. This energy-saving thermostat has up to 4 different daily temperature settings during weekdays and another 4 on weekends. The thermostat can be set to automatically lower the night temperature and raise it in the morning and you will have 2 extra settings that can be set to automatically raise or lower the temperature anytime you want! Unit also allows an appliance to be cut off when you do not want it to be thermostatically controlled and includes a switch which can run the fan on heaters like the Modine and Sterling units continuously and act as a circulation fan. Features an easy-to-read LCD display. Thermostat is battery powered and stores programs in memory during power outages. Use with 24 volt or millivolt single stage heating and cooling systems. Temperature range is 45° to 90° F (1,2, or 3° F adjustable differential). Thermostat also has a backup sensor which activates if temperature drops below 41° F. Batteries included, wiring required. Protect from water and direct sunlight.